Authors: Jonathan Thurgood at Queen Mary University of London, and Richard Morton & James McLaughlin at Northumbria University . Solar plumes are bright, elongated rays rooted in coronal holes, regions of the Sun which are the known sources of the fast solar wind (FSW). Modelling indicates that magnetohydrodynamic (MHD) waves propagating along plumes could play a key role in providing the energy flux needed to accelerate the FSW [2-3]. However, plumes sustain many different modes of oscillation , and models of the solar wind are sensitive to which modes are present, because each has distinct transient, energetic and dissipative properties . The theoretically favoured energy carriers in plumes are a set of transverse waves called fast kink modes. Evidence for these waves was until recently scarce and was based on interpreting spectral line broadening rather than on direct imaging . After the launch of NASA’s Solar Dynamics Observatory (SDO/AIA) in 2010, faint signatures consistent with transverse waves were reported  but direct measurement of the wave parameters was still lacking. Here, we present for the first time a survey consisting of direct measurements of kink oscillations in solar plumes and discuss their implications with regards to FSW acceleration. Figure 1: Solar north pole as seen by SDO/AIA in 171 Å on 2010 August 6 at 00:00 UT. The left panel shows Level 1 data on a log-scale, and the right shows the enhanced, unsharp-masked image on a linear scale. The dashed lines show the altitudes of five slits, which are 200 pixels (≈87 Mm) long and run between the solid lines. We examine four hours of SDO/AIA data in the 171 Å channel, in the vicinity of the solar north pole. The images are processed using unsharp masking, which greatly enhances plume visibility, as seen in Fig 1. As we are measuring waves which have a transverse displacement of the plume axis, we proceed by generating time-series of displacement versus time by following one-dimensional rows of pixels in time which are approximately perpendicular to the plume axis. These ‘slits’ are shown in Figure 1. at increasing altitudes. 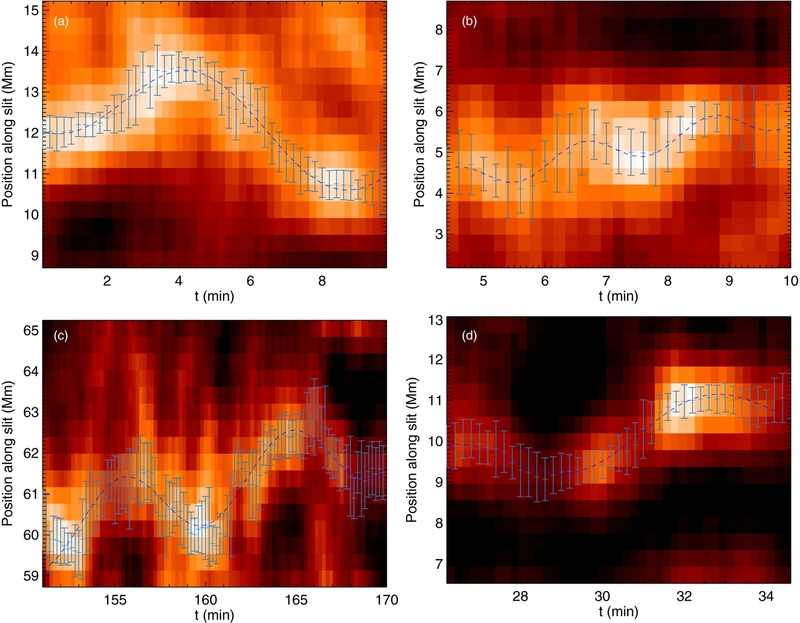 The plume motions are visualised with time-distance diagrams, examples of which are shown in Fig. 2. The intermittent bright streaks correspond to the over-dense, plume structures which exhibit clear signs of oscillation, often persisting for one or more cycles. We employ a tracking algorithm to follow displacement of the plume’s axis over time, which is then fitted with a sinusoidal function. From this we determine the transverse displacement, period, and velocity amplitude of the different oscillations. Figure 2: Close-up view of fitted oscillations. The center of the blue vertical error bars show the feature center from time to time as determined by the tracking routine and the ±σ uncertainty on that position. The blue-dashed curve through the feature shows the best sinusoidal fit to the feature center, from which the wave parameters are derived. Figure 3: Histograms showing the parameter distributions from slit 1. The distributions show a clear positive skew, and can be fitted with a log-normal distribution (blue curve). The mode, median, mean, and standard deviations according to the best-fit distribution are shown. Over the period we take 596 measurements over 5 slits, we find parameter values that are non-uniformly distributed over a broad range, with transverse displacements from 64 to 2558 km, periods from 61 to 2097 s, and velocity amplitudes from 1 to 88 km s−1. The parameter distributions are positively skewed, and are distributed logarithmic-normally (Fig 3). Theory suggests that Alfvénic waves must carry an energy flux of 100-200 W m-2 near the base of the corona to power the FSW [8-9]. We can estimate energy flux using EA=ρvA<v2> where coronal density is taken as ρ ≈ [5–10] × 10-13 kg m−3 and phase-speed as vA ≈ 200–250 km s−1, and <v> is the period-averaged velocity amplitude. It has previously been said that kink waves in coronal holes meet this energy criterion. For instance  estimated velocity amplitudes of v ≈ 25km s-1 using indirect techniques, which yields sufficient flux to meet the theoretical requirement. Our measurements confirm that such energetic waves are present but, crucially, not throughout the volume at all times. Waves having a smaller amplitude are more common, and appropriate weighting must be given to the whole range of velocity amplitudes. This is done by taking the velocity term in the equation to be the log-normal mean, which leads to EA ≈ 9-24 W m-2. These results indicate that kink waves transport a less significant amount of energy through the open-field corona than previously thought. This energy budget, determined by direct measurement, falls short of the minimum required by theory by a factor 4-10. Furthermore, it is calculated according to the equation for waves in unstructured plasma, which corresponds to the most generous case in terms of energy flux. More realistic assumptions about the structuring and inhomogeneity of the medium would yield smaller energy fluxes still, as discussed in . Thus, the evidence suggests that kink waves in polar coronal holes carry insufficient energy to be a dominant source for FSW acceleration.